On the morning of February 20, the Orange-and-Blacks had another session at Bannikov training facility. 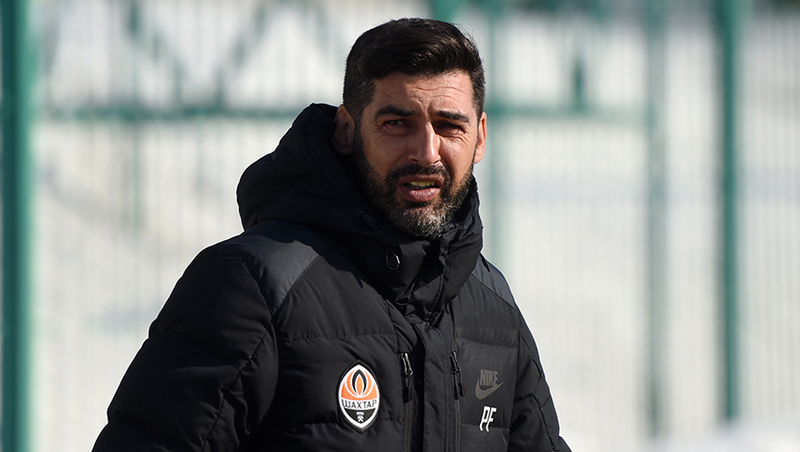 Before the session start, Paulo Fonseca conducted an hour-long theory session, after which the team went to the pitch. Shakhtar midfielder Marlos shared his expectations before the game vs Celta and told shakhtar.com about his return to Kharkiv. - Thursday will see the second leg in the Europa League Round of 32 against Celta. How important is support of the stands to Shakhtar in terms of making it past the Spaniards? - I hope the stadium will be full. It’s nice to know that the Kharkiv fans love Shakhtar. Especially as our team features some footballers who previously played in this city, and I'm one of them. Of course, we will try to take advantage of those factors. First of all, we will be defending the club’s honour, and secondly, we’ll be playing for the people who come to support us. Hopefully, the match will be spectacular. - How did you react to the news that Shakhtar would play their games in Kharkiv? - I was delighted to learn that we would be playing in the city where I’d spent so much time. Personally, I like Kharkiv very much, the people living there, as well as the stadium. The atmosphere at the OSC Metalist is unforgettable. Therefore, I can say nothing but the words of joy. It's nice that Shakhtar move to Kharkiv, and that we will play all of our games there. - Do you still feel something when taking to the pitch at Metalist? - I do, since I’ve experienced many pleasant moments here. Those moments were important for my life and career, therefore I will return to the stadium with great pleasure. Tomorrow morning, Shakhtar will hold a training session in Kyiv, while on Wednesday they will go to Kharkiv. Let us remind you that the Shakhtar vs Celta game is to be held on 23 February. It starts at 22:05. The live broadcast will be available on Ukraina and Futbol 1 TV channels.